A beautiful location during the day and right through to dusk is the Piazza del Campo, a public square and popular tourist attraction in the city of Siena in Tuscany, Italy. A great medieval public square dating back prior to the thirteenth century, Piazza Del Campo in the city of Siena, Tuscany, was once a marketplace for three communities. One of the main buildings in the Public Square is the Palazzo Pubblico (aka town hall) with its Torre del Mangia (bell tower). Throughout the day and into the night the square bustles with activity and is a popular location for dusk photography with soft lighting that showcases the ancient buildings which surround the square. 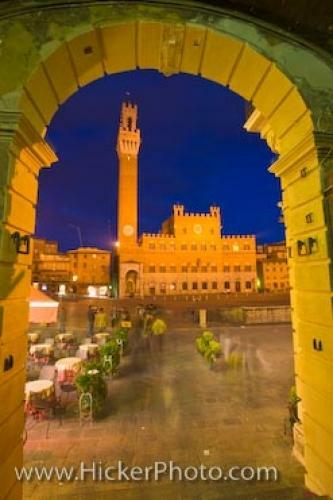 Torre del Mangia (bell tower) and Palazzo Pubblico (Town Hall) in Piazza del Campo in the historic old town district at dusk in the City of Siena, a UNESCO World Heritage Site, Province of Siena, Region of Tuscany, Italy, Europe. (Piazza del Campo) in the city of Siena, Tuscany, Italy.